The efficiency of the ELOS™ technology-based procedures are clinically proven,. It is safe and effective. Duration of the procedure varies between 15 and 30 minutes. In order to maximize the results it is recommended to perform 1 procedure a week for 5-6 weeks. After that prophylactic procedures should be performed 2 times in a month, then once a month and after that the interval of the procedures should be increased according to the rate of improvement. 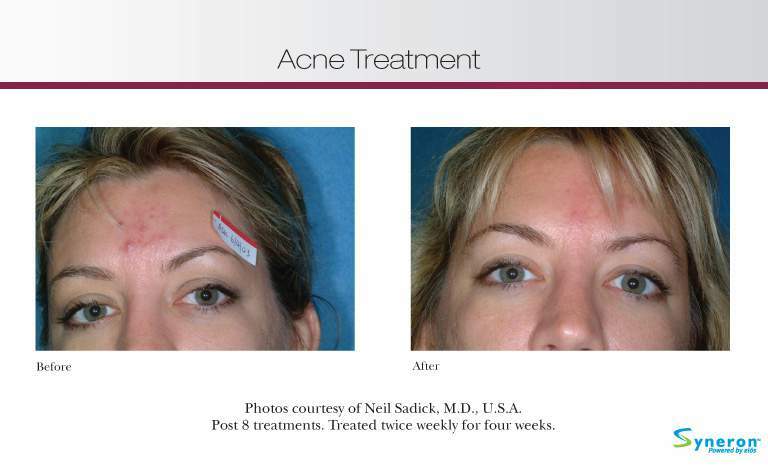 The acne procedure can be combined with other ELOS™ and Sublative™ procedures, as well. Before the ELOS™ acne procedure you will have a consultation with a laser specialist who will determine your skin type, test your skin reaction to an energy pulse and examine any possible contraindications to the procedure. For the secondary side effects of acne (scars, spots) it is recommended to apply the ELOS™ Photorejuvenation and/or Sublative™ procedure. The acne treatment based on the ELOS ™ technology uses a wide light spectrum of 400-980 nm and bi-polar radio frequency energy to affect sebaceous glands in skin. Blue light of short wavelength affects the population of P.Acnes in the tubes of sebaceous glands. P.Acnes bacteria produce porphyrins which are the targets of phototherapy. Light produces free radicals in the bacterial cell membrane which destroy the bacteria and that in turn reduces the inflammation in sebaceous glands. The red and infra-red portions of the optical spectrum, as well as the radio-frequency energy, have a thermal drying effect to produce and secrete less sebum. 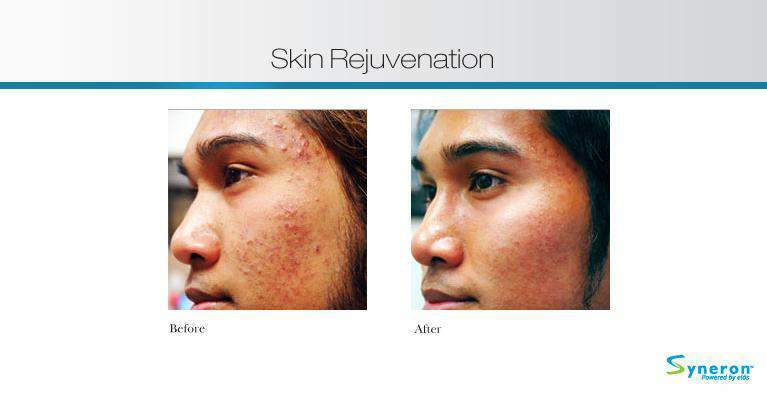 Radio frequency helps to heal acne scars. Even though the ELOS ™ acne treatment procedure reduces and heals active acne, both genetic and environmental factors may cause a new acne break-out. It is highly recommended to carefully observe the skin care regimen and to use oil-free sunscreens, gentle washer/toner, oil and keratin regulation agents such as glycolic acid, AHA acids, retinoids, and other products that help prevent pore clogging. We recommend ELOS™ Photorejuvenation and Sublative™ procedure for acne scars, red and brown spots after the active ELOS™ acne treatment. 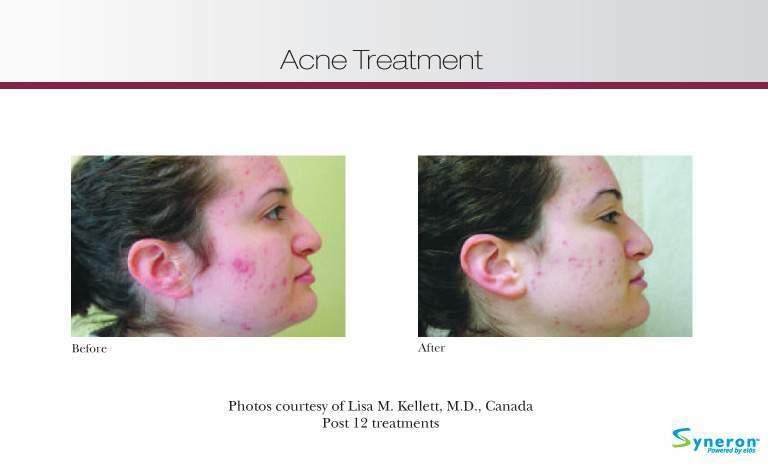 For acne (Acne vulgaris) outbreaks we recommend the ELOS™ acne treatment. Inflammatory knots (big red bumps) NB! We recommend to see dermatologist. For the breakouts of secondary acne or Acne vulgaris we recommend you the ELOS Photorejuvenation and/or Sublative™ procedure. Excess sebum production. The production of sebum is stimulated by androgenic hormones like testosterone and dihydrotestosterone which quantity increases during puberty. Pore clogging caused by sebum and dead skin cells which promotes the formation of comedones. Follicular wall may break causing bacteria and content of comedones get into the skin surrounding pores. That in turn causes inflammatory outbreaks (pimples or pustules). Hormonal factors (higher level of androgenic hormones), polycystic ovaries (common), other hormonal disorders (rare), psychological stress and depression. Environmental factors: high moisture causing swelling of the skin, cosmetic products, especially certain moisturizers, cream powders, hairdyes, oily sunscreens and several active agents (like lanolin, vaseline, vegetable oils, lauryl alcohol and oleic acid). Acne vulgaris is the most common type of acne which occurs in about 85-100% of people at some point in their lives. Usually it occurs during puberty and youthhood but may persist or even worsen during adulthood. Most of the patients with acne have oily skin. Acne vulgaris may occur on face, chest, upper part of back and sometimes on other parts of body with many sebaceous glands. Usually, many different acne outbreaks are visible at once. Single bumps generally stay for less than 2 weeks, however, deeper knots may persist even for months. 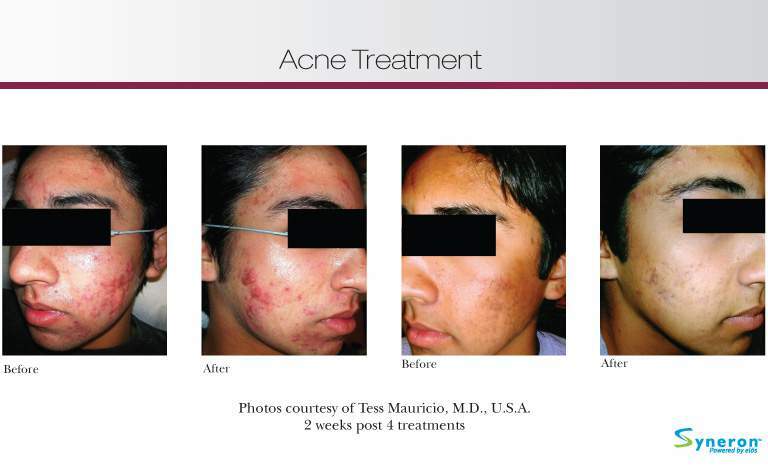 Acne can be light, moderate or severe. In case of comedogenic acne there are more open and closed comedones and in case of inflammatory acne there are more papulas and pustules. Cystic acne is characterized by cysts, knots and depressed scarring. It is recommended to come to the procedure with clean skin and without having applied creams, parfumes and make-up. Sunbathing, solariums and self tanners should definitely be avoided 2 weeks before the procedure. The procedure can not be performed on tanned skin! Also using photosensitivity-causing medicines (Roccutan,Tetracycline etc. ), blood thinners (Marevan etc. ), herbal extracts (Hypericum etc. ), vitamins (vitamin A etc. in large amounts) and food additives and food products in large amounts should definitely be avoided before the procedure. After applying hard facial chemical resurfacing or surgical procedures, you should wait at least 2 weeks to 3 months before coming to the procedure. The procedures are not recommended to pregnant or breastfeeding women, or people suffering from porphyria, severe diabetes, lupus or epilepsy. The procedure is not performed on people who have or have had skin cancer or some other tumor or who have to use electric cardiac pacemaker. Before the procedure it is recommended to consult with a treatment specialist.